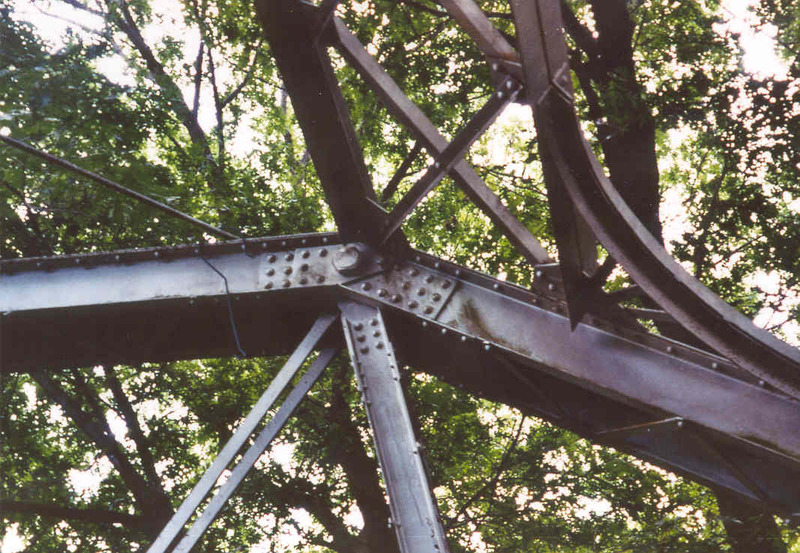 This page features details and information about the sole surviving span of a multi-span structure that once stood where the present day Jenks bridge now stands. The original Jenks Arkansas River Bridge was built in 1909 by The Canton Bridge Co., Canton Ohio. It consisted of a series of pin-connected through Parker spans. 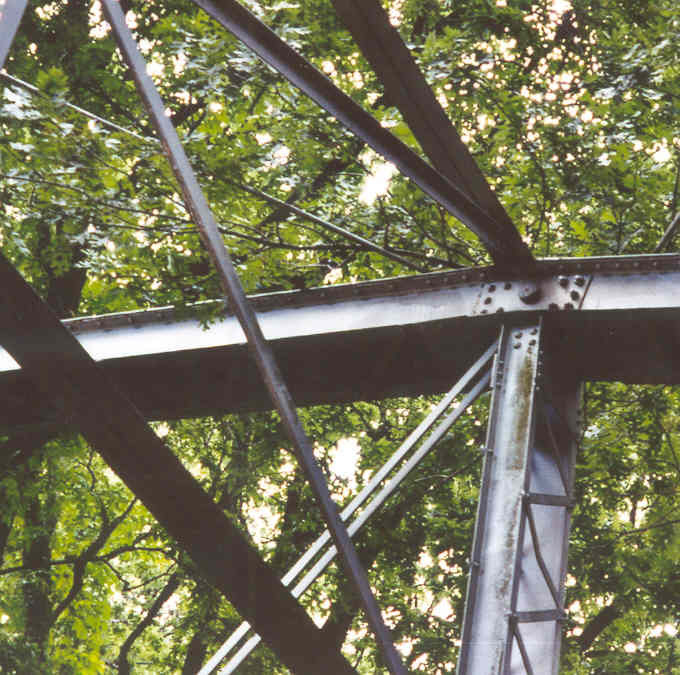 The photo below is an overview of the only remaining span from this structure. This span is 165 feet long. The photo at the left shows the bridge at its current location. 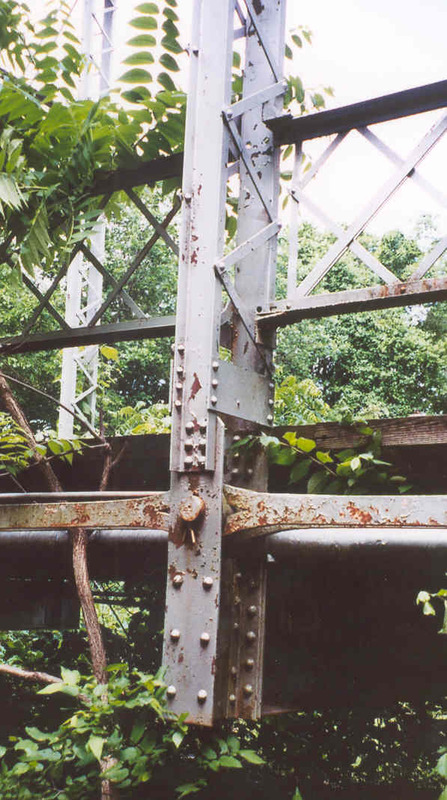 The 19 span pony truss bridge at Jenks was built in 1948, and we assume that the 1909 bridge was dismantled soon after the completion of the pony truss bridge. We do not know when this span was moved to its present location. 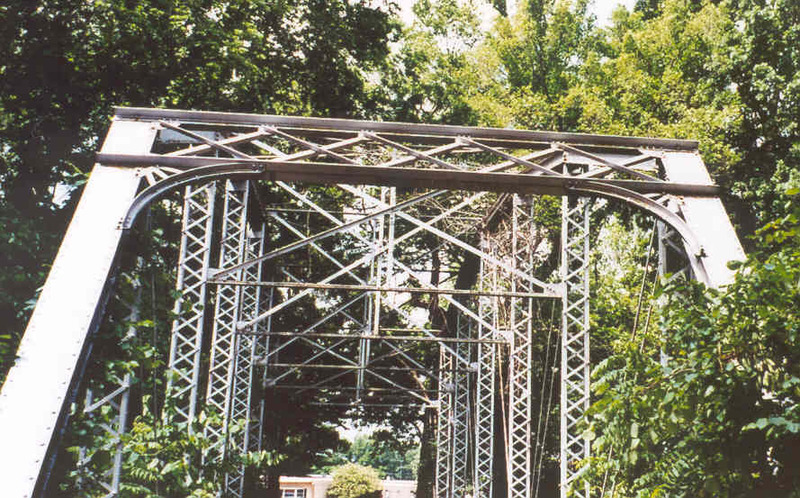 This sole surviving span from the Ohio built 1909 bridge now serves as the entrance to a mobile home park. 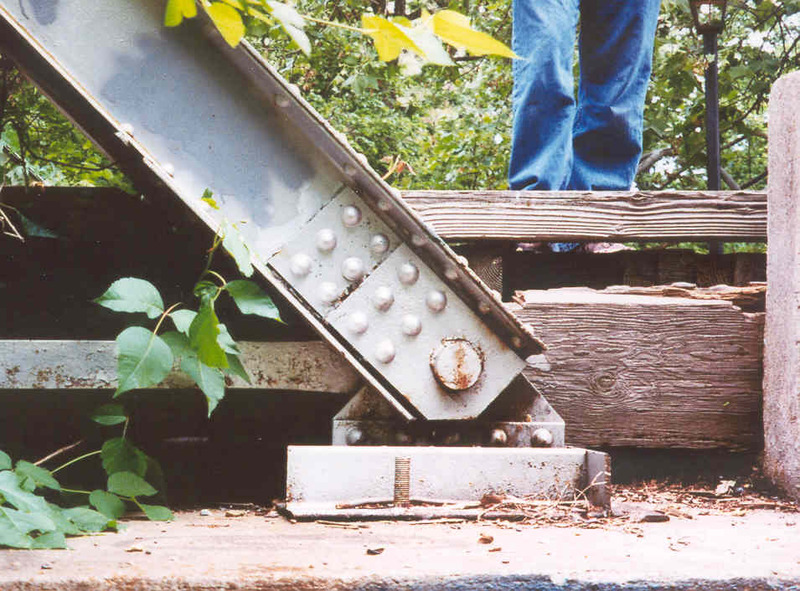 This bridge is one of the two oldest bridges in Tulsa County. 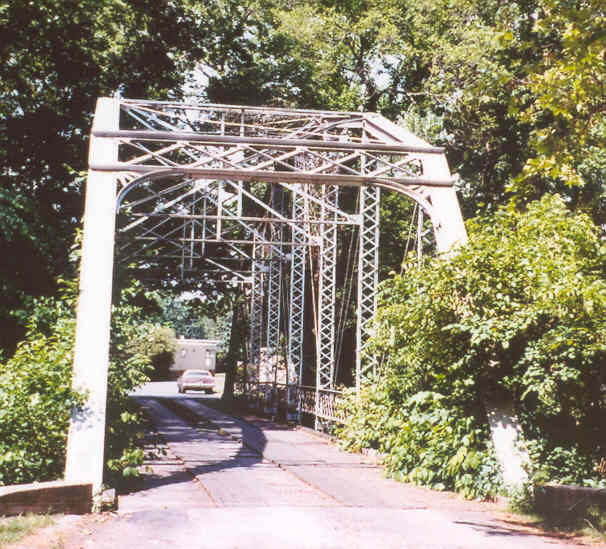 From 1938 to 1944, this bridge served as part of OK 11 at its original location. During this time OK 11's south terminus was at Glenpool. The photo at the right shows where this span would have been in relation to the 1948 bridge. You can clearly see the stubs of the piers that the 1909 bridge stood on. 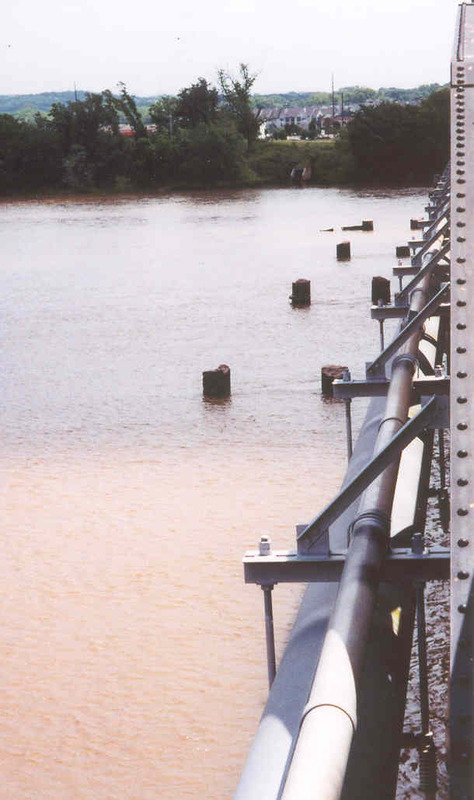 These piers were very likely riveted steel tubular columns filled with concrete, a very popular method of making bridge piers in the late 19th and early 20th centuries. The pier stubs can be seen only about half-way across the river. The 1909 Jenks River bridge was the second bridge the Canton Bridge Co. build for Tulsa county to cross the Arkansas River. 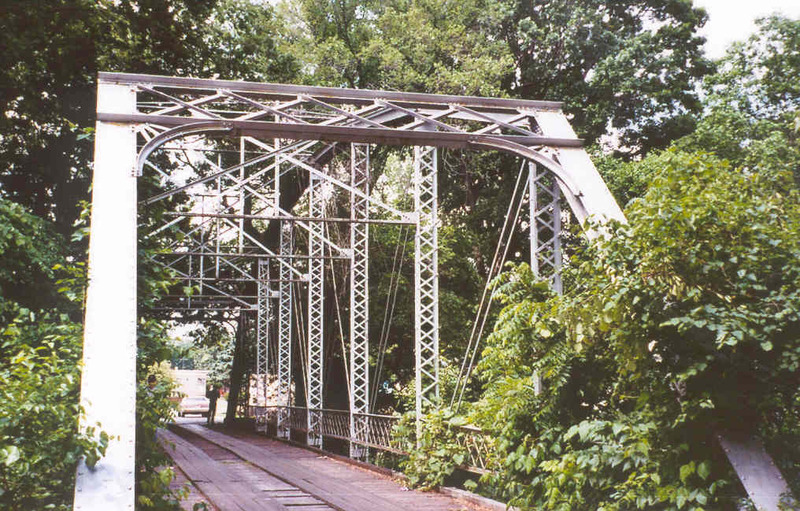 In 1904, the Canton Bridge Co. built the first wagon bridge across the Arkansas River. 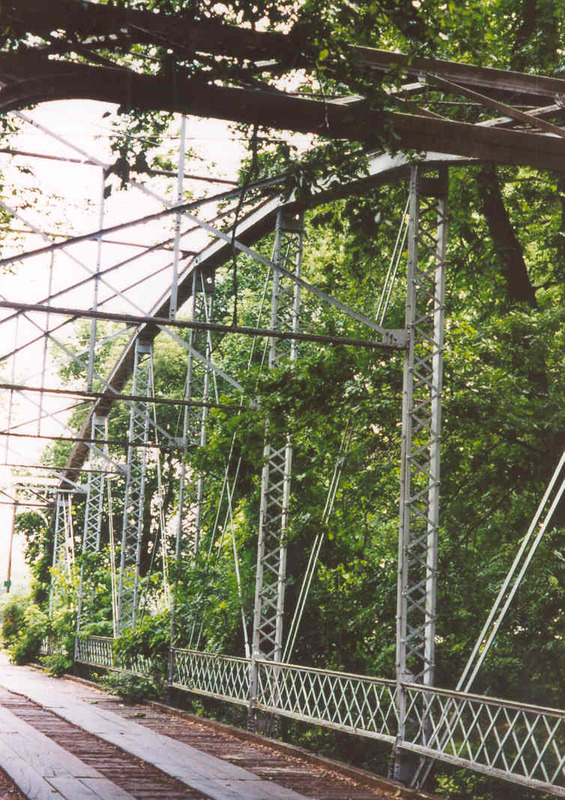 This structure stood until 1915, when it was demolished to build the now abandoned 11th Street (old US 66) bridge. Below, a view of the bridge's portal from behind. Above, a closer overview of the bridge. Below, detail of the hip joint. 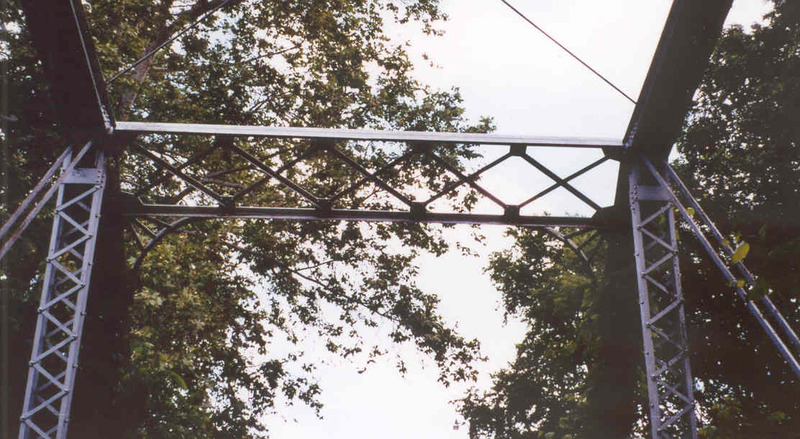 Above, a close view of the truss from the bridge deck. Below, detail of the bearing pin at the intersection of the endpost and lower cord. Above, a detail of the lower end of the hip vertical. Notice the use of cotter pins instead of nuts on the pins. Below, typical connection of web member to lower cord. The vertical member in this photo is in compression. Note once again the use of cotter pins and the change in size of the eyebar in the lower cord from one panel to the next. Above, typical member intersection along upper cord. The pins have a hex head on the inside side, and a cotter pin on the outside side. 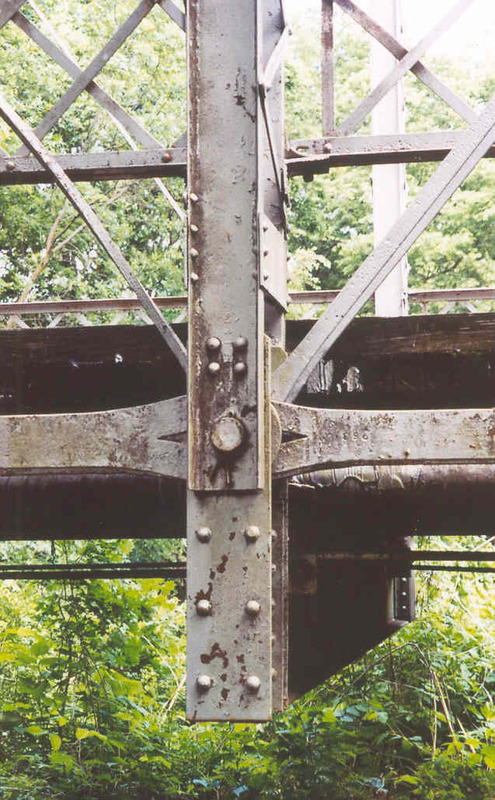 The bolts in place of rivets in the gusset plate are a result of the bridge having been dismantled and moved. Below, detail of lower cord. Member in the foreground is the hip vertical. 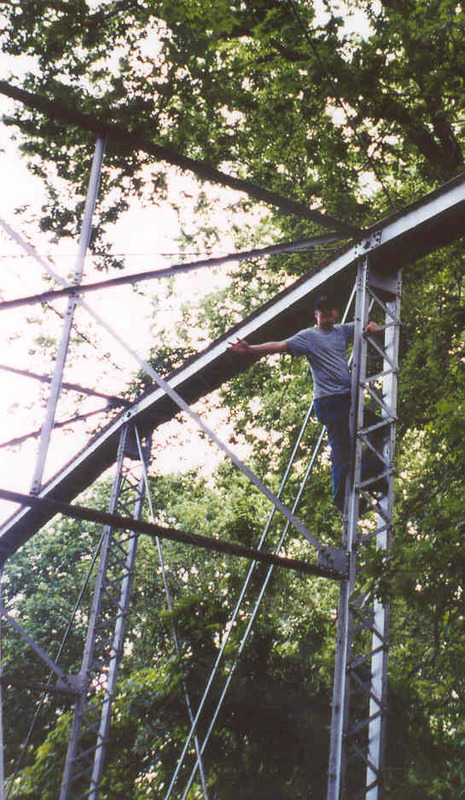 Above, David climbing up into the bridge gives a good scale as to the sizing of the members. The channels and lacing bars are very light weight. Below, a close view of the bridge's portal. Note the very Victorian-esque treatment of the knee braces. Below, a side view of the span in its present surroundings. The trailer park is located within a mile of the Jenks Bridge along Riverside Drive. The bridge seems to be well kept and is a grand entrance to a residential area.